Glass coffee tables are an effortless way to open up the space in your living room interior. This is because the transparency of the glass allows you to see the floor through the table surface, therefore not breaking up the look of your existing scheme. 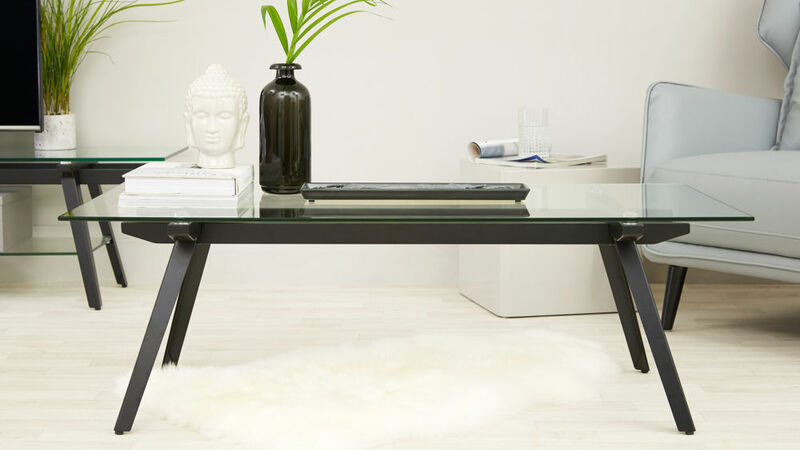 With the Neo Glass Coffee Table, you get the illusion of more space from the glass with the added feature of the smooth black powder coated legs. 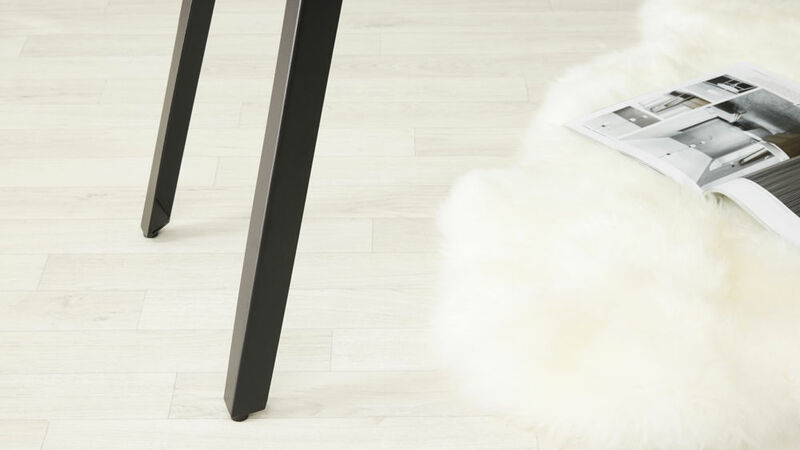 The legs add a touch of interest while giving this modern coffee table a really sleek and impactful look. The Neo Glass Coffee Table measures 40cm in height, 60cm in width and 120cm in length. This considered sizing means there is plenty of surface space for drinks and TV remotes, but the table doesn't take up too much room in your space due to its streamlined design. 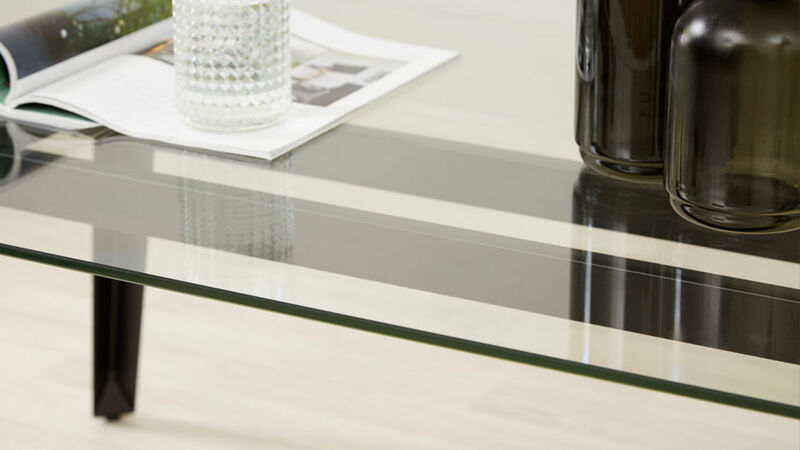 The surface of the Neo Coffee table is made from 10mm tempered glass. The glass has a bevelled edge and slightly rounded off corners, meaning that there are no really sharp edges to bump into. This makes the coffee table that bit safer around younger children, while also helping to soften the overall look. The use of tempered glass makes the Neo table incredibly durable. Tempered glass is by no means fragile as it's toughened to British Standards, making it one of the strongest surface materials you can get for the home. Another advantage of a glass coffee table is that, because you can still see the floor through the table surface, you get an optical illusion that doesn't break up your space creating a feeling of more room. The legs of the Neo table are made from a moulded piece of steel and are finished with a lightly textured black powder coat. It's a really forgiving finish that not only looks effortlessly sleek but is easy to clean too. With its slim glass table top and contrasting black steel legs, the Neo Glass Coffee Table is a true definition of modern style. 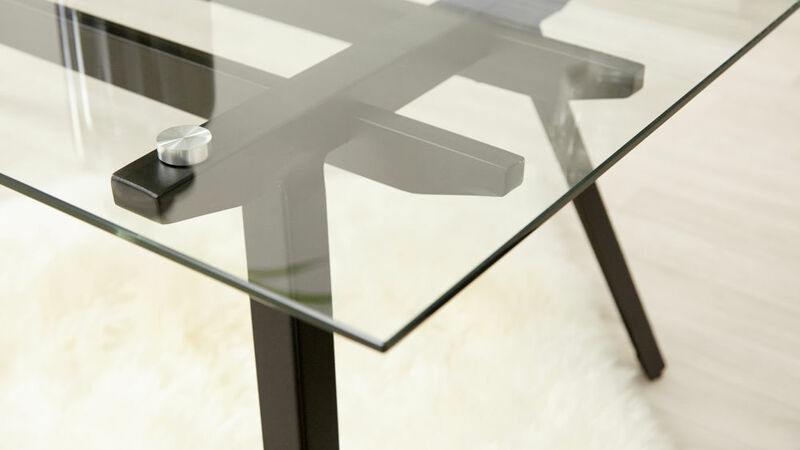 The stand out feature of the Neo Glass Coffee Table has to be its slimness and angular design. Because the legs are made from moulded steel, you get clean, crisp lines without the table looking heavy or overpowering. The tempered glass table top is extremely strong, sturdy and durable but is only 10mm thick, helping contribute to the Neo tables streamlined shape. The transparency of the glass keeps this coffee table looking visually light while the black powder coated legs add a touch of interest. The black coated legs are quite a stand out feature, great for adding a modern look to your living room interior.